It’s that time of year again! Our Spring Book Fair is in full swing, and we are collecting donations to make our Book Fair Scholarships for this fair a success. Each year we raise hundreds of dollars to fund scholarships for hard working students that can’t afford to purchase books from the Book Fair. This year, we have a record number of students in need – which means that we need your help. Why donate? Why give money for other kids to buy books, when you’ve already scrounged to provide for your own? Why purchase a raffle ticket for a basket full of stuff you don’t really need? Because while we’re fundraising, Johnson students are busy writing; each applicant must complete a scholarship essay to be considered for an award. Instead of telling you why I think you should give, I’ll let the recipients of your generosity speak for themselves. The Book Fair Scholarship Committee hopes to fund almost 100 scholarships this Spring. 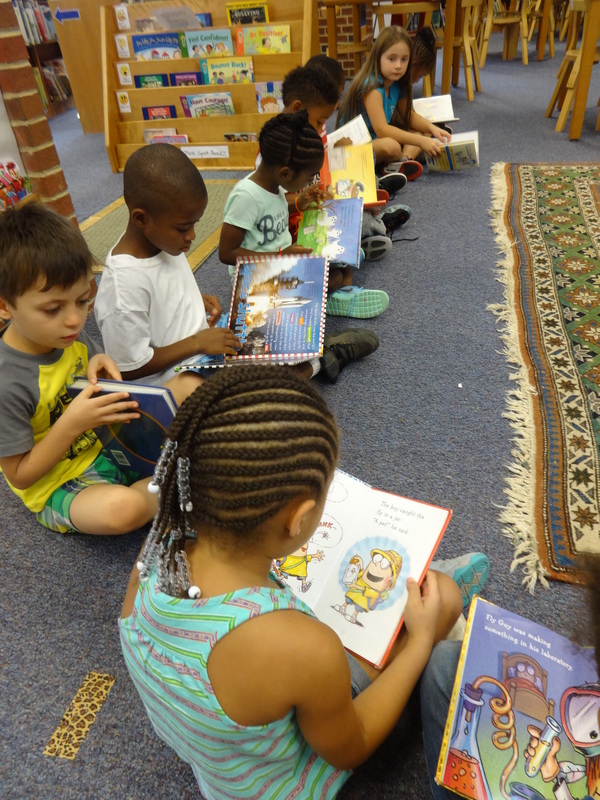 You can donate to the Book Fair Scholarship Fund by visiting the Learning Leopard Library, or by contacting me (fitzhes1@charlottesvilleschools.org). Spring Book Fair Raffle tickets will be on sale through this evening’s family shopping event at the Spring Concert (cash only). Somewhere during the STEAM Team madness, I got an email. Local non-profit Light House Studio had an idea for a workshop that would be perfect for our tech-savvy, ever curious scientists. Would I like a STEAM Team project about movie making and science? Nope. No thanks. I don’t want this to be a part of STEAM Team. Because it is WAY. TOO. COOL. This idea doesn’t deserve to be a short project tacked onto another club. This spectacular combination of high tech equipment and old fashioned hands-in-the-dirt activities deserves its own spotlight. Luckily, LightHouse agreed – and Lights, Science, ACTION! was born. During Lights, Science, ACTION!’s eight week session, students are learning the ins and outs of basic filmmaking, including types of shots, types of cameras, how to run sound equipment, film set lingo, and interviewing and directing techniques. They are getting hands-on experience with state-of-the-art film and sound equipment, along with different types of filmmaking like stop-motion, claymation, and special effects. They are getting a peek behind the scenes of the editing process, learning the basics of layering video and sound, editing scenes to get the very best result, and adding special features like transitions and effects. And Light House Studio’s dedicated, experienced, patient mentors are with them every step of the way, providing individualized attention and instruction to help each child get the most out of the time behind the lens. After our initial filmmaking workshops, the science experiments began. Each week, a small group of students gets to act as the documentary crew while the rest of the group participates in a short science lesson and experiment. The group shares stories and ideas about natural science while the crew records the action, ambiance, and interviews. All of the footage is edited and combined by the experts at Light House into a final project, which we will premiere on our final meeting in May. Whether we’re creating art from nature, digging (and chewing) in the garden, or studying animal behaviors, our science experiments help students to make observations and ask critical questions about the world around them. Together with our parent and community volunteers (pop quiz – can you spot Mr. Fitz in these photos?) we are working on being more inquisitive, curious, and creative; all while working towards teamwork and a growth mindset. As an added bonus, the filmmaking aspect of the club helps students to see their world through a different lens (da-dum-ching – see what I did there?). They have to answer new questions like, what will a viewer need to know to understand this experiment, without having heard the directions? Which students are focused enough to appear on film? Does this shot show what our group is all about? These questions force students to walk in a teacher’s shoes for an hour or two – and it is both hilarious and humbling to hear their reactions about how difficult it can be. So much of students’ time in school is spent working quietly and independently towards the goal of a good grade on a test or assignment. These skills are essential for students to develop, but they’re not the only skills needed for a well-rounded, successful, and happy child. With so many demands and limitations placed on teachers, even Johnson’s exemplary staff can’t always get kids learning through moving, shaking, and making. 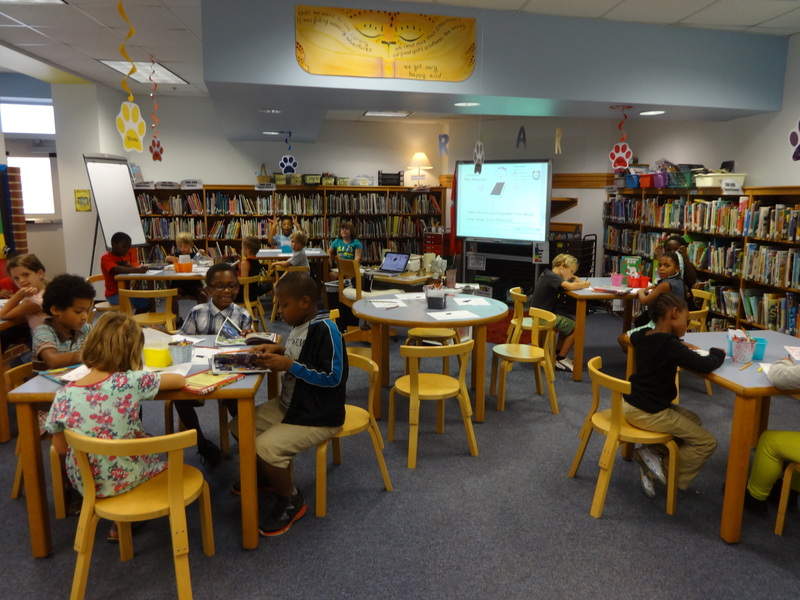 Thanks to the generosity and expertise of the Light House Studio team, the Learning Leopard Library can provide third and fourth grade students with rich, engaging, hands-on experiences that allow them to learn at their own speed, in their own way. Students are transformed when they are allowed to take an active role in their own learning – and whether they’re behind the camera or up in a tree, students on the Lights, Science, ACTION! team are exploring, growing, and making connections in a way that they won’t soon forget. Keep your eyes on this space for more news and photos from Lights, Science, ACTION! This program will continue after school in the library through mid-May. Now that’s a mission I think we can all get behind. Find out more about Light House Studio including their locations, wonderful staff, and more ways that they make an impact in Charlottesville by visiting their website here. Over the past few months, Johnson second graders have been working even harder than usual. These students have stepped out of their comfort zone to become role models, mentors, and teachers to a few lucky first graders – and I couldn’t be prouder. The videos embedded below were designed, scripted, shot, and “edited” by second grade students (with just a little help from a certain librarian). I challenged them to remember what it felt like to be a first grader getting ready for second grade, on the cusp of new independence and academic rigor. What advice did they wish that they had had as a new second grader? What wisdom have they gathered during their time in the second grade? Where are all of the Iron Man books?! With these questions in mind, we set about brainstorming, mapping, and shooting our movies. As part of the challenge, I promised that the class with the best video would be published to our library’s YouTube channel. But after watching all three, there was no way that I could choose. You can find the links to all three videos below! As second graders have learned more about video recording and editing, they have also been honing their teaching skills. 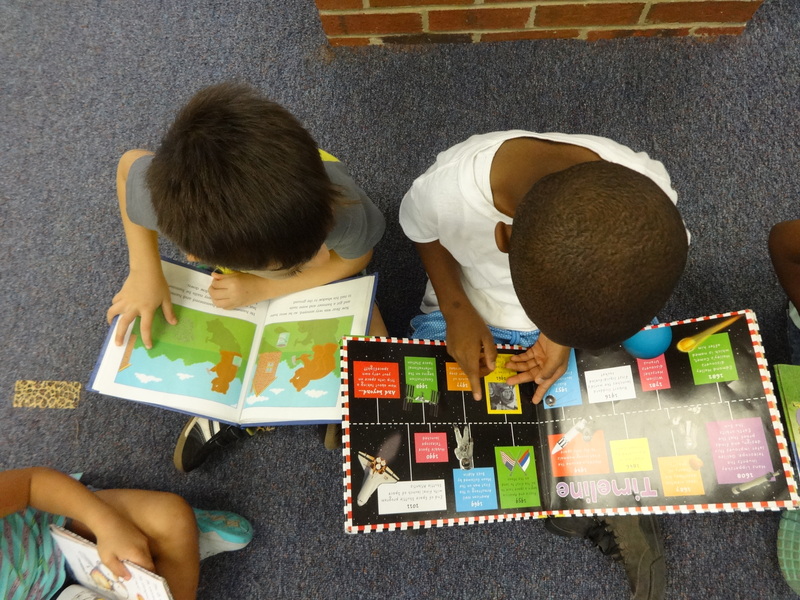 This week, they came to the library during first graders’ scheduled library time and each spent 30 minutes coaching a first grade buddy in all things second grade checkout. This special time together included checkout tips and tricks, a special screening of their class movie, and guided tours of the library’s collection. Second graders rose to the occasion with excellent behavior and kind, patient teaching far beyond their years. They took their responsibility to the younger students seriously, and showed their pride, ownership, and understanding of our library. First graders not only left better understanding what library looks like as a second grader, but also feeling inspired and excited by how much their older mentors cared about them, about our library, and about the Johnson community. Second grade classes, you should be so proud of all of your hard work on this special project! You can watch the videos on our library YouTube Channel, or via the links below. Great work, second grade! The Learning Leopard Library been lucky enough to develop a wonderful relationship with Pi Beta Phi, a service sorority with an active chapter at the University of Virginia. 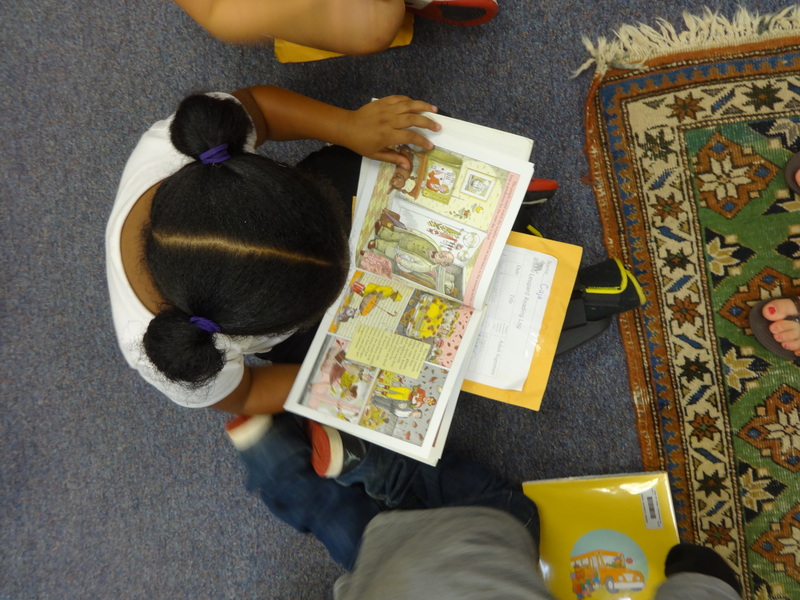 Over the past few years we have read together, celebrated Seuss, and received generous donations of books for our students, classrooms, and library. I’m so happy to be welcoming the ladies of Pi Beta Phi back into the library this year. Johnson’s lucky kindergartners will be the target of the sorority’s CAR program. CAR stands for Champions are Readers, and these dedicated ladies will be giving kindergarten students valuable small group and individual reading time once a week. This afternoon, our first group of UVA students joined us in the library and whisked students off into cozy corners in the sunshine to read. 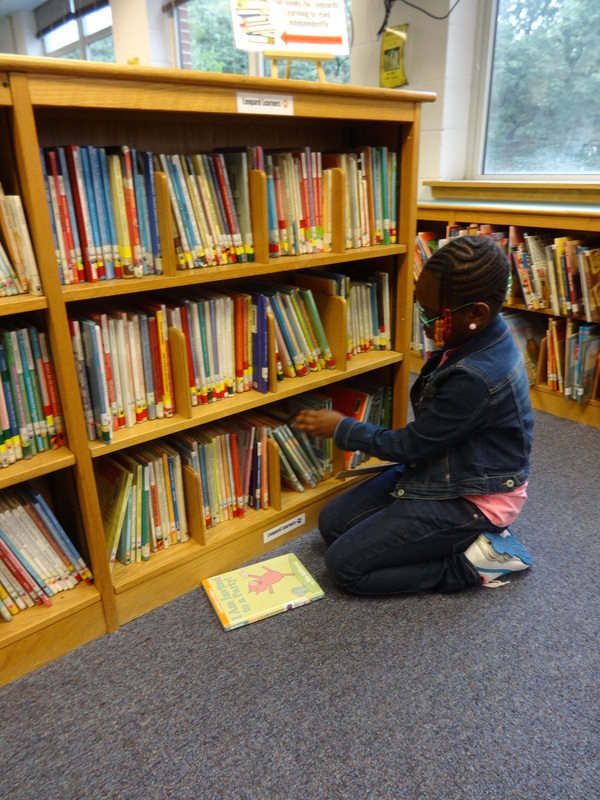 As an added bonus, because they are in the library, students are sharing books that they have chosen on topics that they feel passionate about – and the mix of sharing stories and student interest are sure to be beneficial to our young readers. I look forward to spending time with Pi Beta Phi each Friday afternoon and watching Johnson’s kindergartners grow to be more confident, passionate readers. Thank you for selecting us for your CAR program, Pi Beta Phi! We’re so happy to be working with you. This short story was written by Angel, a Johnson Elementary School student, and shared with the library via Google Docs. Angel drafted and typed the story independently. Angel is in the fourth grade. We had a special four-legged visitor on Thursday, and she had ALL of our tails wagging! Stacy Diaz, teacher at Walker Upper Elementary School, is the owner and handler of some very special dogs – and she shared one of these amazing pooches with us on Thursday morning in a special presentation. Luna and Ms. Diaz travel to schools and throughout the community to share their message on how to help children feel safe, confident, and happy around dogs. I have had the pleasure of working with Luna, Ms. Diaz, and two of Ms. Diaz’s other therapy dogs (shout out to the lovely Pina and True! Hi guys!) during their time with Books on Bikes, and they both know how to make even the shyest of children giggle. You can see some evidence of Luna’s tail-wagging fun with Books on Bikes on the Books on Bikes Facebook page! Luna helps children of all ages and of all comfort levels to learn that dogs can be safe, friendly, and lovable. During her visit to Johnson, Ms. Diaz taught us all about Luna, including some fun facts – Luna is a Pitbull, and she is deaf (she even takes commands from Ms. Diaz in sign language)! She explained that as a licensed therapy dog, Luna has a special job in the community. Then, Ms. Diaz taught students some tips and tricks on how to approach a dog that they might see in their neighborhood or walking around Charlottesville. Students even got a chance to try out their new pooch skills by petting Luna if they felt comfortable. Check out this short video from Ms. Diaz’s visit to learn even more about Luna, pick up some tips on how to approach and pet dogs, and see some Johnson Leopards make Luna’s tail wag with happiness! Thank you, Ms. Diaz, for sharing Luna and her special skills with us. We loved having you and look forward to working with you again soon! Learn more about Stacy, her dogs, and her Positive Reinforcement Based Training system here. This morning, reporters from NBC29 stopped by the Learning Leopard Library to find out all about our Hack-a-Thon. They crashed a third grade Choose Your Own Adventure Code Party, where third graders get to choose their mission for the day – code your Minecraft characters to build houses? Program your own Flappy Bird game? Write your own digital Star Wars story using Blockly Java Script? 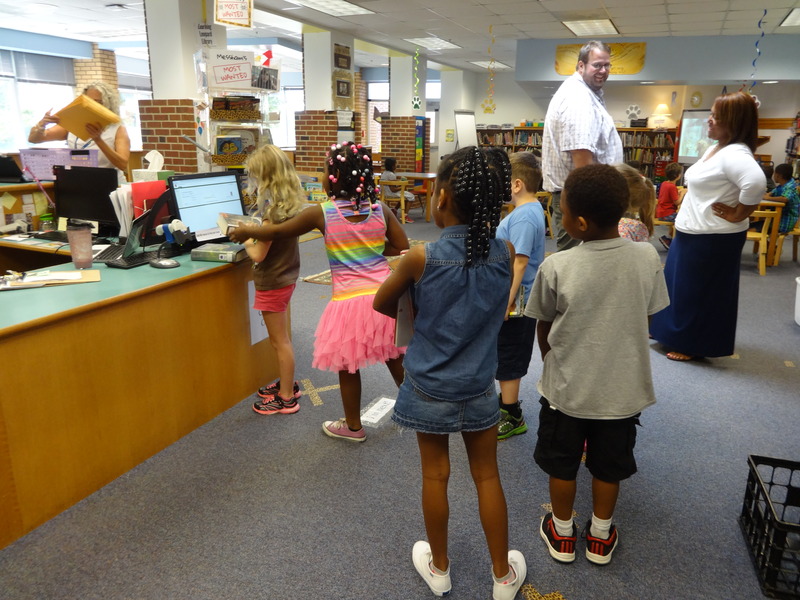 NBC29 took a tour of our library and the digital MakerSpace that we have been creating for our coding and programming time. After filming third graders as they worked, the reporters even interviewed a couple of hard-working pint-sized programmers about our challenge. Reporters asked students what they like about coding, whether it feels like homework, and why they want to learn to code. Brandon and Graham rocked the house and weren’t nervous at all, even in front of the cameras! Great work to the Johnson Leopards that have been working so hard to reach our 100 hour goal (we just reached 94 hours!). Thank you NBC29 for coming to talk to us and spreading the word about the Hour of Code and computer programming in elementary schools! Keep an eye out for our NBC29 story tomorrow on the morning news. If you miss it, check back here for the link after it goes live online. Last week, I issued a challenge to our third and fourth graders. A big challenge. A big, scary, challenging challenge. I challenged Johnson’s third and fourth grade students to code and program for 100 hours during the month of December. Let’s get some background here. Kids these days are savvy tech users. They can swipe a touch screen and navigate a Google search effortlessly. They’re comfortable around all kinds of devices and aren’t even a little bit intimated big the world wide web. In other words – they know their way around a computer. But they don’t know how to program one. Code.org states that there are currently 604,689 computer programming jobs open nationwide. OPEN! Sitting there for the taking! And if that many jobs are unfilled now, imagine how much the number will grow by the time our third and fourth graders hit the work force. In last week’s Family Connection: Code Like a Girl post, I shared this GirlsWhoCode.org fact: with you: The U.S. Department of Labor projects that by 2020, there will be 1.4 million computer specialist job openings. Yet U.S. universities are expected produce only enough qualified graduates to fill 29% of these jobs. Coding is a superpower. If you don’t believe me, listen to Bill Gates and Mark Zuckerburg – they’ll tell you. It’s a language and a world and a power, and not all of our kids have access to it. We’re not giving them the tools that they need to be successful in the world because they don’t have computers at home; because internet access is to expensive; because there’s no time to teach them; because they’re just a kid. But if there’s one thing that I’ve learned about kids during my time teaching, it’s that their passion for knowledge can overcome anything, if they’re given the chance. So I issued a challenge. 100 hours in three weeks. Students log their time in class exploring Code.org’s resources and games with me and Mr. Jones (Johnson’s amazing, talented, and oh-so-creative Instructional Technology Resource Teacher), but that’s not enough time for them to reach their goal. In order to break 100 hours, they need to keep coding and exploring at home. They’re making Angry Birds fly, programming futuristic Star Wars robots, helping Minecraft’s Steve and Alex build shelter to shield them from the zombies, and making Scratch’s iconic feline sprite dance and turn pink. Since hours that students code at home count, I keep the Code-o-Meter in the hallway in the morning so that I can the add kids’ hours as they walk to class. It didn’t take long for our Code-o-Meter to start going up..
Computer coding and programming teaches invaluable skills like critical thinking, logic, problem solving, sequencing, and growth mindset. It encourages students to take creative risks, learn from their mistakes, pick themselves up and try again. Bigger. Better. Smarter. It helps them to develop the skills that they need to succeed, both in front of the screen and in front of the boardroom. In the past two weeks, I have seen some of my most shy, quiet, and self-conscious students squeal with delight and jump with victory. They triumphantly announce their tally of code lines (the amazing challenges at Code.org not only tell students how many lines of code they have written, but give the option for students to see it in HTML formatting mode) and celebrate each other’s victories. They’re not playing video games – they’re programming them. Sometimes it’s a statement – “I can CODE!” and sometimes it’s a question – “I can CODE? !”, but no matter what, it’s a victory. Want to ensure that your kid catches the computer coding bug? Code with them! Coding activities and games are a great way to spend time together. The resources listed above are for hackers of all ages! Check back soon to see if we reach our Hack-a-Thon goal! Tomorrow, Ms. Messham is getting married. She is getting married outside where the ocean is, because there is a nice breeze. When she was dancing, she fell into the cake. Then the cake was wobbling and it fell on her face. Shew as angry because the cake got all over her wedding dress. Then her husband helped her get up. Then she went to the dry cleaners to get her dress washed up. And then she said, “You better have it done in one minute.” And they did it! But when Ms. Messham got back to her wedding, they didn’t have any cake. Then Ms. Messham had to go to her house and fix another wedding cake so that they could have another cake for their wedding. After she made the cake, she came back to the wedding and she was really happy. Finally, she stood up in the sand and got married! This short story was written by Brandon, a Johnson Elementary School student, and shared with the library. Brandon drafted and typed the story with guidance. Brandon is in the third grade. I think I speak for all of us when I say… How is it the fourth week of school already?! As usual, the days are flying by and I’m just getting Monday under my feet by the time Friday arrives. With four weeks under our belt, students are starting to get used to their classrooms, the cafeteria, and their Johnson family – which means the good stuff is starting! I am loving stopping by classrooms to see all of the creative, exciting, educational work being done. When it comes to learning, the the library is certainly bustling. 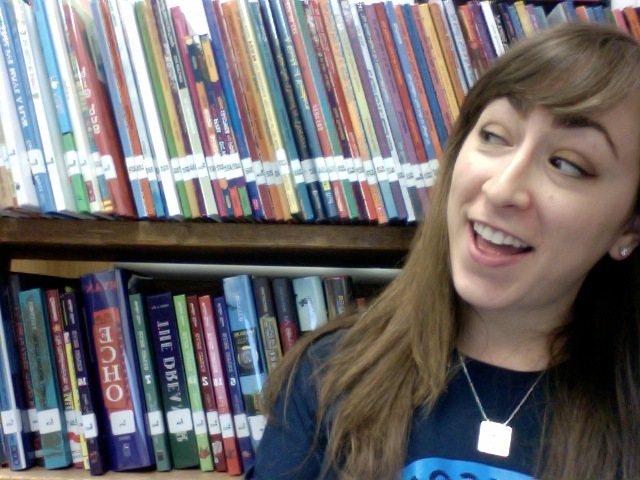 Here’s a quick glimpse into some recent library happenings! 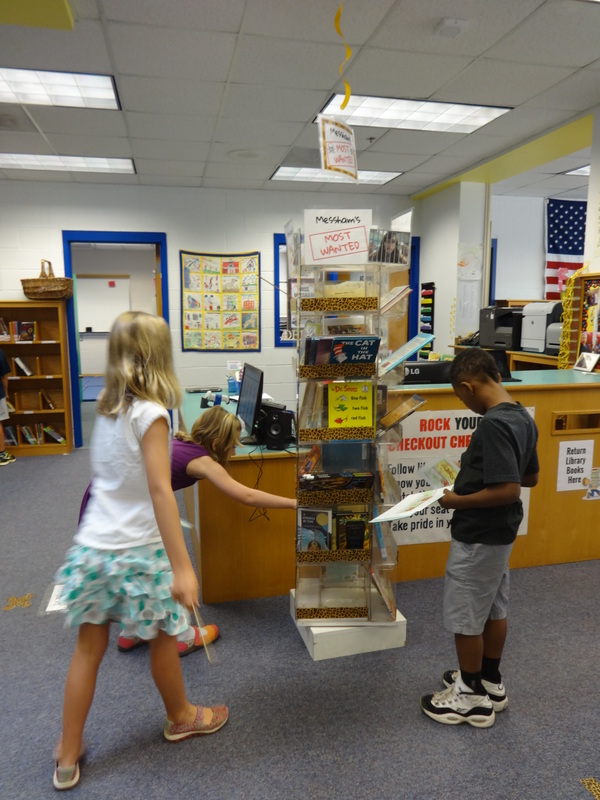 The Golden Shelf competition kicked off last Monday (learn more about that here!) and it has been heated! 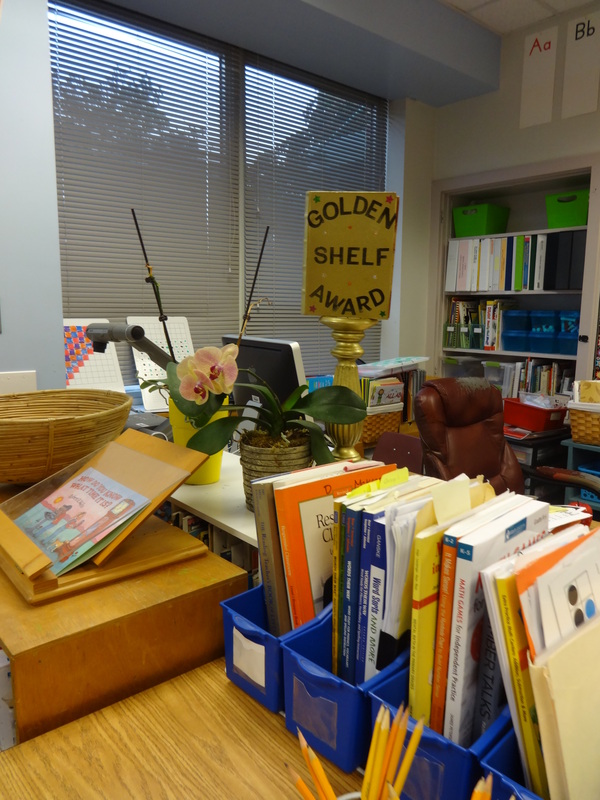 Here the Shelf residing proudly in the classroom of its first winners for the 2015-2016 school year – the second grade Golden Knights. 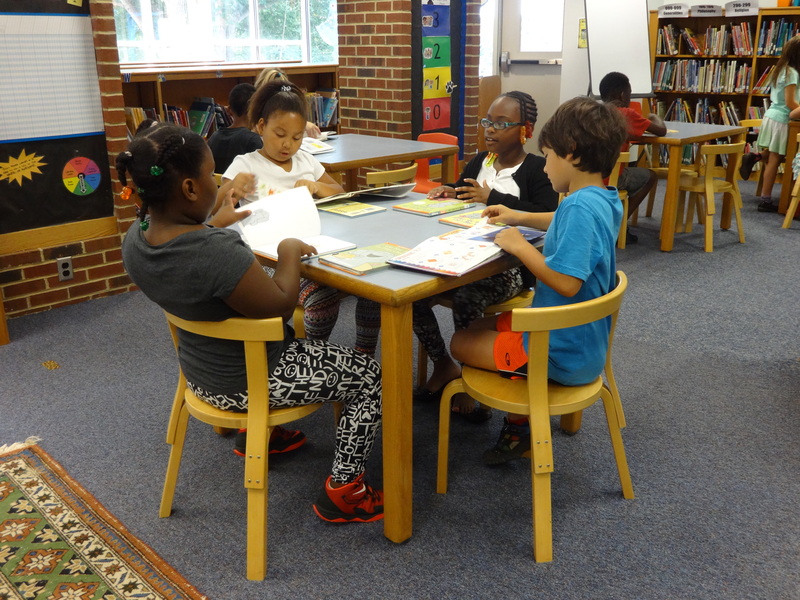 The Golden Knights team has students from Mrs. McKeon and Mrs. Machen’s second grade classes that attend library class together. Way to go, Golden Knights! 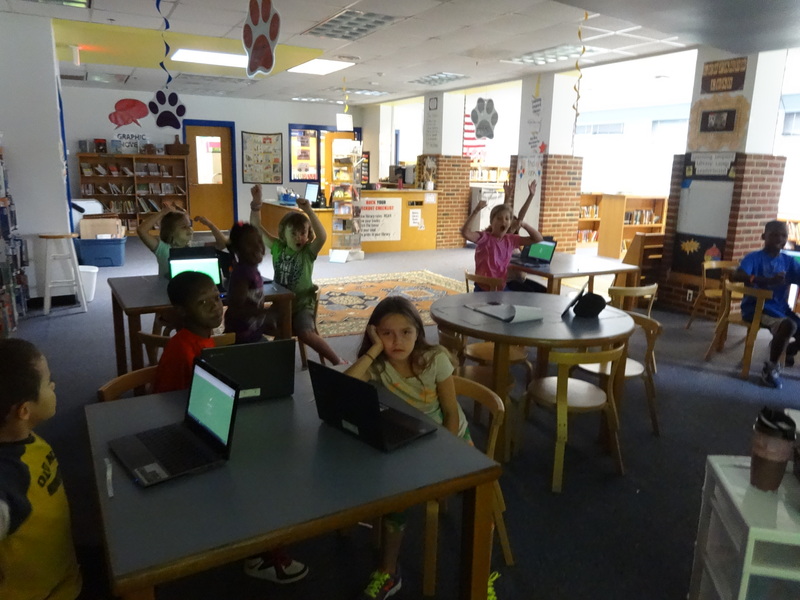 Third and fourth grade got their tech on this week with Kahoot, my favorite new online game. Kahoot is an interactive competition that allows students to participate from their seats on their own devices, while keeping score and staging the competition on the Smart Board. Students sign into our class game using a special pin code, we share questions together on the board, students answer from their seats, and then the winners show up on the score board for the room to see. In this photo you can see some students that see their name in the top five… and some students that aren’t so happy with their scores! Kahoot is my favorite new tool because it gets everyone in the class involved, for maximum engagement and maximum fun. You can play Kahoot from any device, and browse and play Kahoot quizzes made by other members! Check out the Kahoot quiz third and fourth graders took this week, all about online safety and being a good Digital Citizen, here. Test your knowledge and play at home with your Learning Leopard! To say that Johnson students were excited to start checkout again would be the understatement of the century. Second, third, and fourth graders are thrilled to be back in their old routines and bringing books home. We’re all a little rusty, so it’s a good thing we’ve been doing lots of practicing! 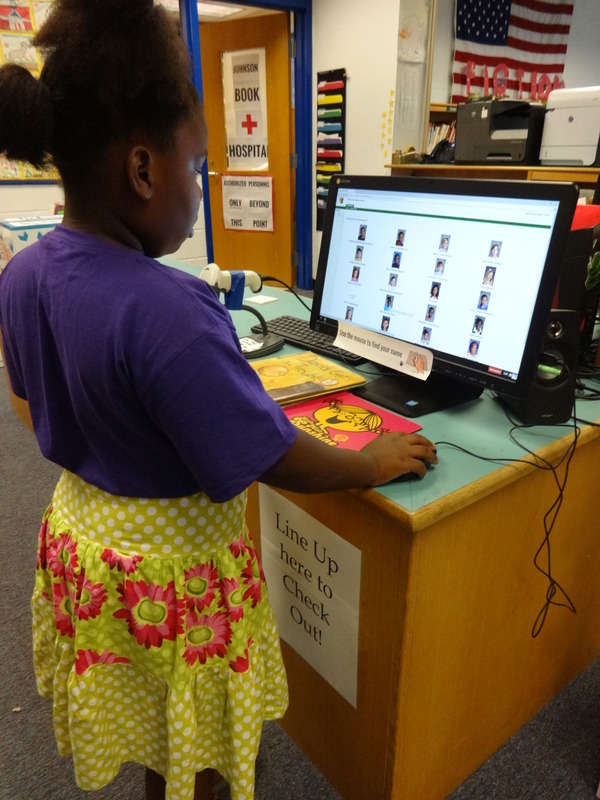 Kindergarten and first graders are enjoying their checkout, too. I’m lucky enough to see kindergarten for a full hour each week, which means we get tons of time to check out and enjoy some quiet reading by ourselves and with friends. Our youngest students pick up routines so fast, I’m amazed by how much they can already do! A beautiful gift was waiting for me this week – brand new books for the library! A generous and kind Johnson family made me teary with their donation of these beautiful books for our collection. 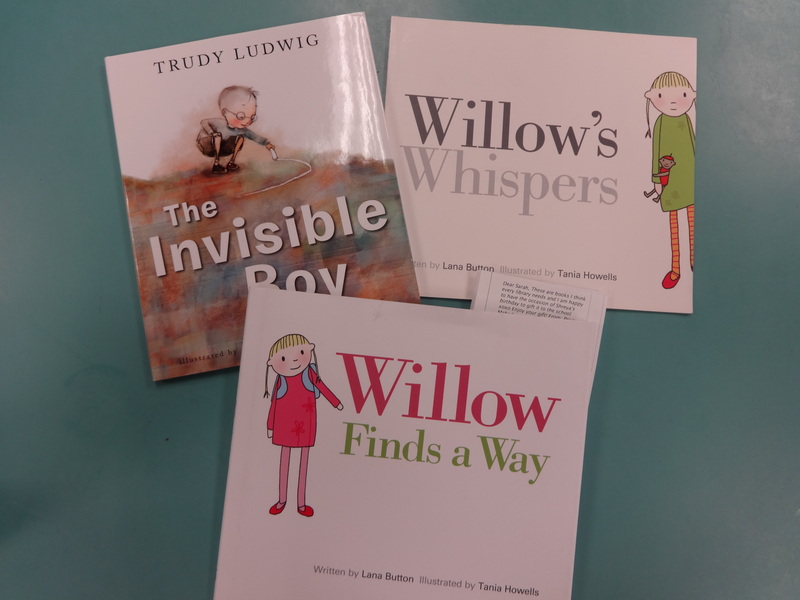 Each book has a valuable message; kindness to others, celebrating what makes you unique, dealing with bullies. These valuable titles are such an excellent addition to our collection, and I know that they will be beloved by students and teachers for years to come. Stop by and check them out! 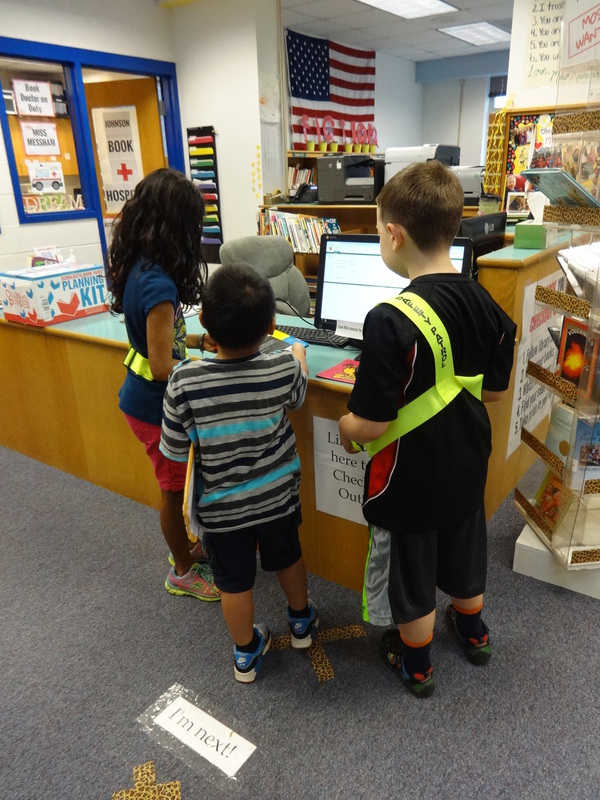 The library’s new Safety Patrol crew has started, and they wasted no time getting down to business. 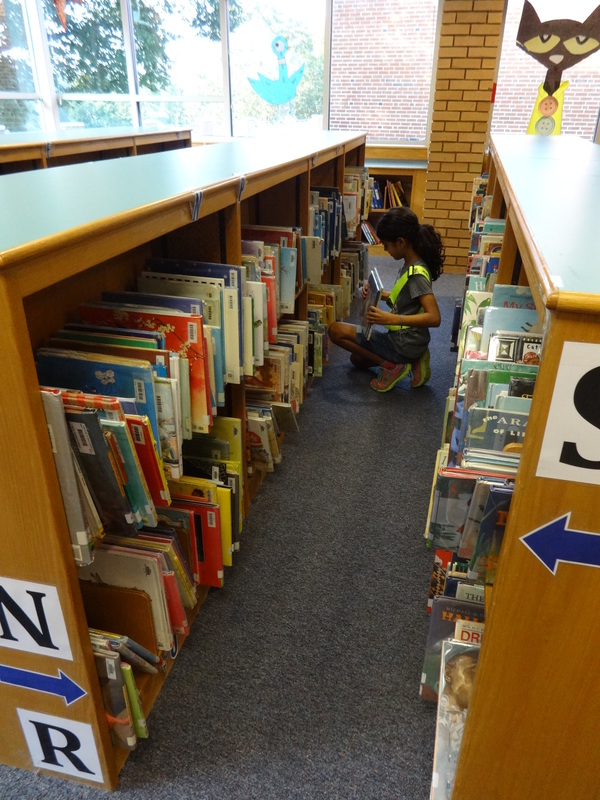 Above, you can see Sahana and Chase shelving books and helping kindergarteners to check out. These hard working students help to check books in, answer student questions, organize and shelve titles, and run computer stations, among a million other responsibilities. I couldn’t run morning checkout without this invaluable help, and I love getting to spend the extra time with two special fourth graders. 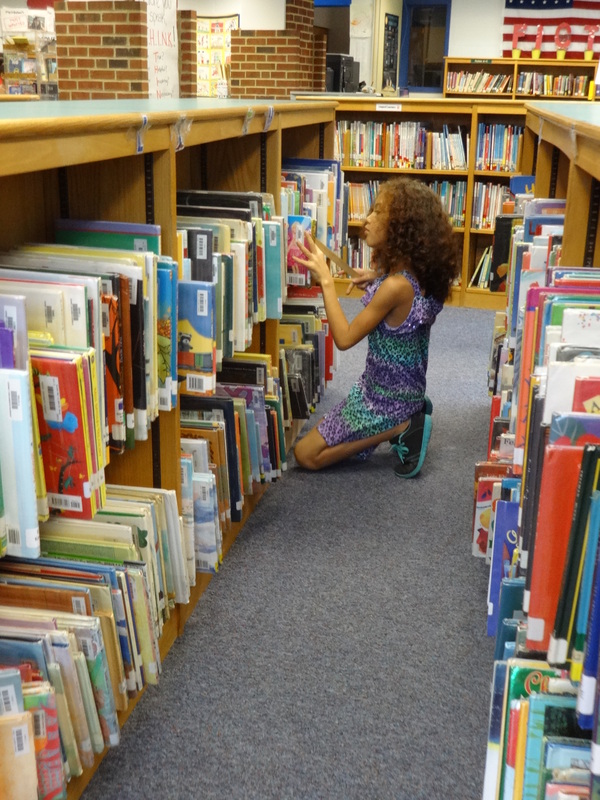 You’ll see a lot of Sahana and Chase’s adventures in the library this year! 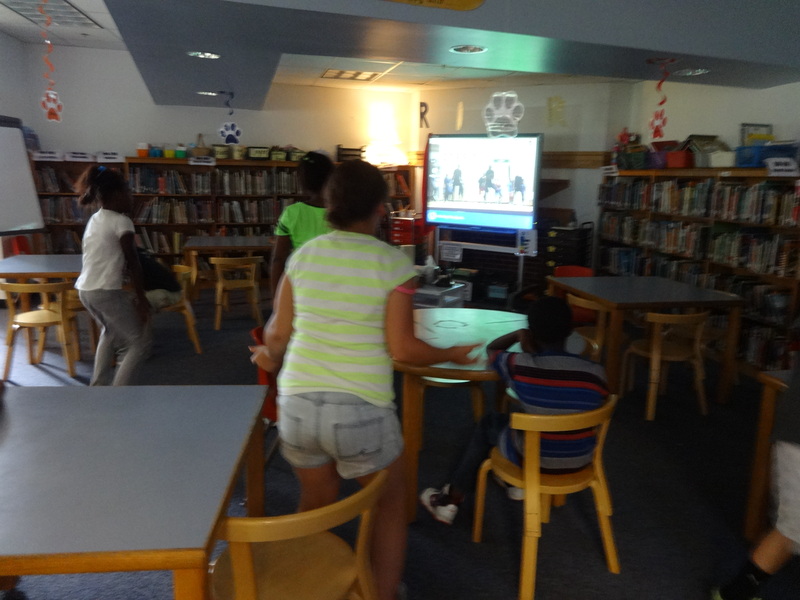 We may do a lot of reading, but by now you know that our library is much more than just a book collection… above, my second Golden Shelf winning class, the fourth grade Waylanders, take a dance break in the classroom area. They’re ready for Let’s Move club! When you get this many awesome new titles to add to your library collection, it needs to be documented with a new book seflie. Hundreds of new books will be hitting the shelves next week! Check back for an update on the latest and greatest additions to the Learning Leopard Library collection. I’m crossing my fingers for a sunny and cool fall weekend. Enjoy some time with your families, and hopefully a story or two!